Rolex. A Gentleman's Stainless Steel Oyster Perpetual Date Explorer II Automatic Wristwatch (FS42/290) offered in our Two Day Fine Art Sale starting on 16th April 2019 at our salerooms in Exeter, Devon, with a pre-sale estimate of £8,000-£12,000. The next Fine Art Sale is nearly upon us and there a many highlights to mention throughout the sale. It is often difficult to choose which items to mention, because this type of sale covers such a vast array of antiques and fine art. Day One of the auction (Tuesday, 16th April 2019) starts off with around 250 lots of silver, including a pair of George II silver cast candlesticks (FS42/247) by the maker William Café, London 1759. With foliate decorated drip trays, urn shaped scones and weighing 38.37ozs, this super pair of candlesticks are estimated at £600-£800, whilst an Elizabeth II beaten silver goblet (FS42/71) by the maker Rod Kelly and dated London 2011 is inviting bids of £2,000-£3,000. The jewellery auction is next up, commencing at 12:30pm with just over 100 lots of jewellery being offered. Within this, there is a good selection of wristwatches, inncluding a gentleman's stainless steel Rolex Oyster Perpetual Date Explorer II automatic wristwatch (FS42/290). 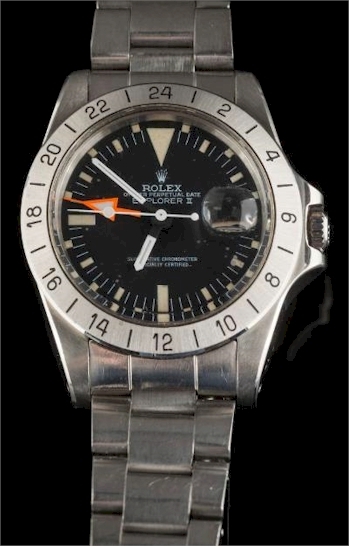 The Explorer II was launched by Rolex in 1971 and this particular model features a fixed bezel with 24 hour hand originally to help cave explorers distinguish the day from night hours. It is known as the 'Steve McQueen' as it is rumoured to have been worn by the famous actor. It is also known by collectors as 'Freccione', as a short form for 'orange hand'. Much interest is anticipated for this super wristwatch, which is being sold with its original Rolex guarantee certificate and original purchase receipt, green Rolex box, Rolex pouch, Rolex International Service guarantee card, Rolex manuals and spare link. The pre-sale estimate is £8,000-£12,000. Other lots of particular note in the jewellery section include a turquoise and diamond mounted necklace (FS42/349), the diamonds totalling 8.5cts, which carries a pre-sale estimate of £3,500 -£4,500 and an illusion set diamond three stone ring (FS42/389), which is inviting bids of £4,500-£5,500. Paintings follow on, commencing at 2:30pm with just over 100 lots. An interesting painting by Noel Coward is one of the lots on offer, an oil on board of Portofino (FS42/433) depicting a harbour view with figures on a quay and moored boats. This pretty painting is signed by Noel Coward and invites bids of £3,000-£5,000. Another highlight in the pictures auction is the Thomas Luny (1759–1837) oil on panel of Teignmouth (FS42/447) depicting figures on a shore, with coastal craft and Shaldon Bridge beyond. Signed and dated 1828, the pre-sale estimate is £3,000-£5,000. Day Two of the Fine Art Auction commences on Wednesday, 17th April 2019 with the ceramics auction of the sale. Again there are many highlights, but of particular note is an Italian maiolica istoriato footed dish (FS42/562) painted with Picus on horseback pursuing a boar and the sorceress Circe gathering herbs. Although cracked from rim to centre, and with minor chips, this dish, probably Urbino, circa 1560, carries a pre-sale estimate of £1,500-£2,000. Worthy of note is that in Roman mythology, Circe turned Picus into a woodpecker after he sprurned her advances. Another highlight is a St James's (Charles Gouyn) gilt metal mounted scent bottle and stopper (FS42/592) in the form of a bird with wings spread and one claw clasping a tree stump. Circa 1755 and with some restoration, the pre-sale estimate is £800-£1,200. The works of art auction of the sale, which follows not before 12:30pm includes a beautiful 20th Century Italian bronze and ivory dancer (FS42/857). The figure is arching backwards with her right leg raised and she is holding castanets and wearing a flowing dress. The figure is signed and numbered Rossi, 3763 and raised on an onyx serpentine fronted base with gilt metal surround. The estimate is £2,500-£3,500. Two unusual and large 19th Century circular stained glass windows (FS42/867) are looking for a new home. Formerly from a property in North Street, Barbican, Plymouth, these impressive windows are estimated at £2,000-£3,000. The final section of the auction is furniture, which will commence not before 2:30pm. Of particular note in the furniture auction is a fine Louis XVI style mahogany and gilt metal mounted vitrine in the manner of Paul Sormani (FS42/1033), which carries a pre-sale estimate of £2,000-£3,000, and a set of nine 19th Century oak dining chairs in the Hepplewhite taste (FS42/944), which have are estimated at £1,500-£2,000.